Minolta X-700 purchased at a local Goodwill in Baltimore. Today I decided to go in a random Goodwill with my boyfriend, Andrew. Andrew was searching for a fixed-gear bike to spruce up. 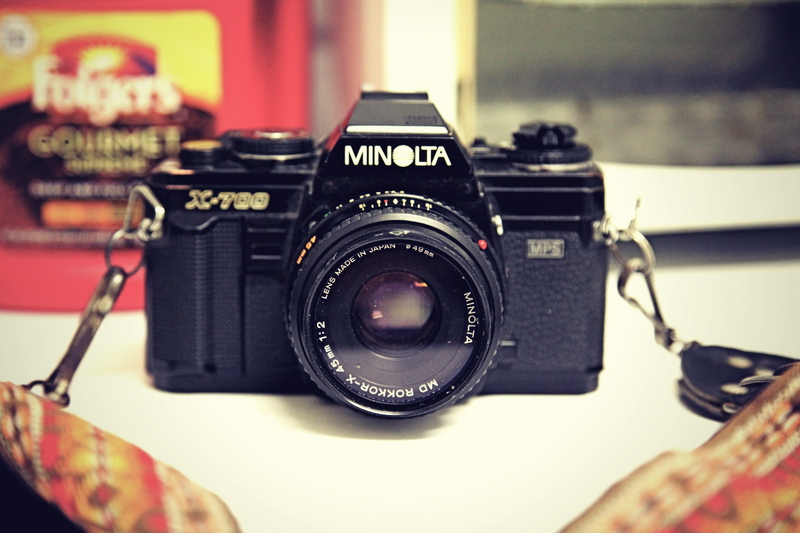 There were no bikes, but lo and behold, imprisoned behind a glass counter there sat a vintage 1980’s Minolta X-700. Now, I know this blog is targeted towards cameras predating 1980 but I figured it was a good lesson in treasure hunting for you guys. If you read my last entry, “No Time Machine, No Problem”, you’d know that stores like Goodwill often offer hidden treasures. Sometimes they don’t all work but sometimes you can really get a great deal. Today, I got a great deal. How did I know? Well, remember, we start with checking out the lens, or if you want to speak the photo jive, the glass. They had several lenses available, the one I decided to go with was the 45mm, which offers a wider range of photo possibilities. This lens happened to be a Minolta Rokkor-X 45mm with an F2. I did some research and it retails for around $60 in good condition. I got it for $6. After checking out the lenses, we surveyed the body. The shutter curtain was in amazing condition, very important. The foam, which we talked about in the “Light Leaks and Why They’re Cool” post, was newly replaced or maybe it was the original foam. Regardless, all of the light leak potential spots were safety sealed off. 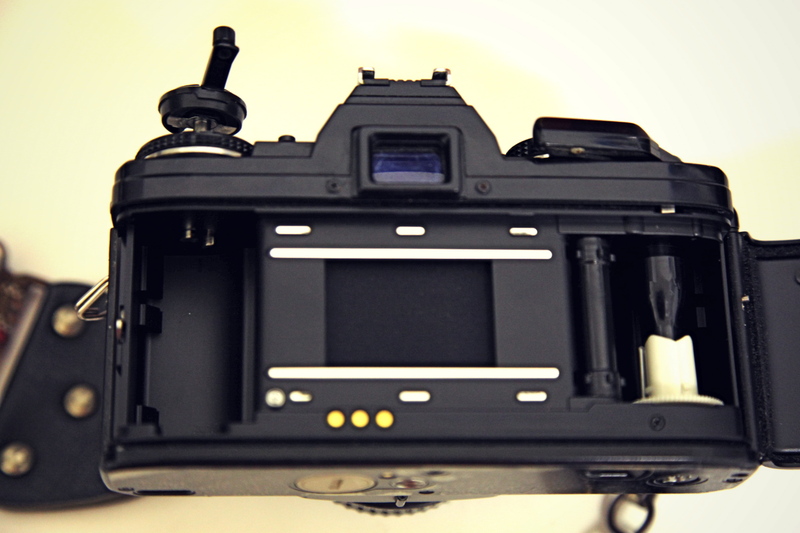 Inside of the Minolta, it’s always very important to check the condition of the curtain, seals, and film spool. Lastly, we checked to make sure our shutter worked. Unfortunately, the battery was dead. 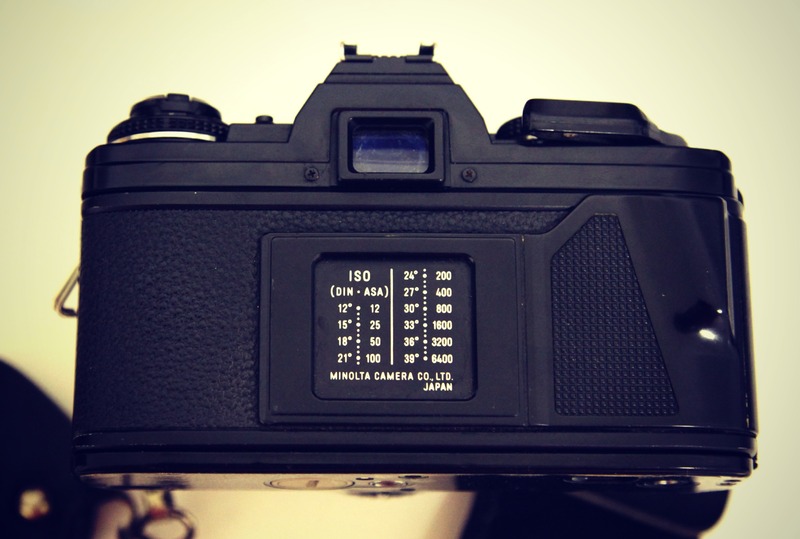 This model is battery dependent, so it is NOT fully manual like most antique cameras. The battery will be replaced tomorrow and we will get to testing this little fellow out. 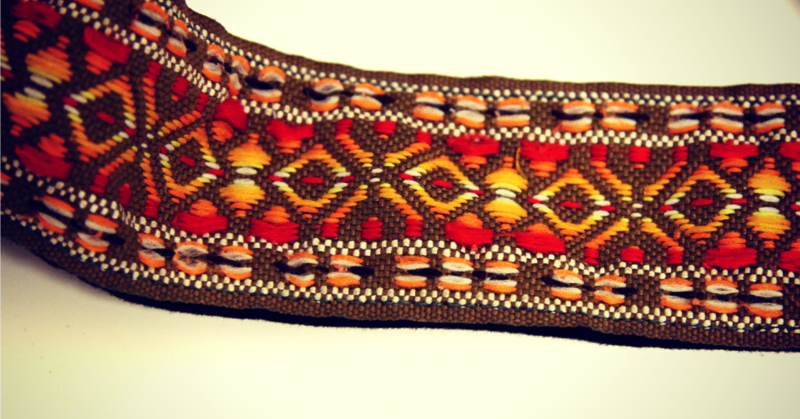 Camera strap that is very symbolic to the SLR film cameras made in the 1970’s and 1980’s. Oh and not to forget, the camera also came with a very cool strap reminiscent of the 1970’s and early 1980’s boho hippy styles. So what was my final gain? The camera body retails for around $90-$100 nowadays and that lens is estimated at around $60. My Goodwill setup is worth about $160 and what did I pay? $24.50… Happy Treasure Hunting! Excellent post! Hopefully the batteries will work out and that little gem will be up and running! WOW great find Kait! Can’t wait to see the photos you take with it! I loved reading this. I really enjoy all your blogs.. they impact my life is so many ways. what made you decide to buy this one? Thank you! I’m glad you enjoy my posts so much 🙂 I decided to buy this gem because it was in great condition, and to be honest that awesome strap was what caught my eye. The lens that was sitting next to it is also a hard to find lens and for $6, it was a steal! I love how you know everything about cameras. it’s really amazing! I need to find better deals on my camera equipment! not only are you a writer, photographer and amazing person, but a bargain shopper also! Thank you Allison also known as Gurtrude with a U. But I hope I can be a true bargain shopper and find cameras that actually work. Oftentimes people think that a cheap camera is worth it but spending $25 for a camera only to realize it will take $150 to have it fixed really isn’t worth it! That money could have gone to processing film. You are so lucky and you find the coolest things! What a lucky find! Amazing……to find an old camera with film that included pictures of a relative at someone’s yard sale……..what a lucky kid! Sounds like a one in a million find! I’ll have to do a post about it! Possibly this weekend 🙂 Definitely interesting. Looking forward to doing more reading on this! That’s amazing! Goodwill is a magical place.